Cleaning upholstered furniture on your own may be a money-saving experience but if you don’t know what you are doing, you may actually ruin your furniture. 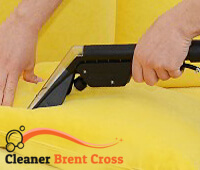 Here at our company we know best how to rid armchairs and sofas of stains and dirt and we recommend you to use our upholstery cleaning in Brent Cross. We are experienced and qualified technicians who go through extensive training every now and then. We know everything about cleaning furniture and we use expensive and effective cleaning equipment as well as a special cleaning program. We are very committed to this job. Make sure to call us. 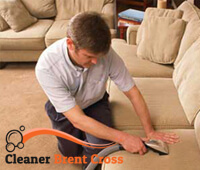 Without doubt our upholstery cleaning in Brent Cross is a great decision for all your upholstered items, no matter how old. We will use effective cleaning methods in order to make your furniture clean and refreshed. Before we begin cleaning, we test the spots and stains and apply special cleaning solutions that loosen the stain. We also get rid of small and large particles and debris using our powerful vacuums. We are very careful throughout the job. Before we use any of our solutions we test out a small area to make sure the formula won’t harm your sofas or chairs. In addition, we steam clean the items, which works wonders to remove bad microroganisms, bacteria and dust mites. Since upholstered furniture is a trap for all these bad bugs, the combination of high temperature and pressure is very effective in killing these things. We are very easy to find. All our services are currently provided within Brent Cross and if you would like to make an appointment, you don’t have to make a trip to our office. You just need to give us a ring whenever convenient for you. And that’s all. We will visit you shortly after and get all the work done to a high standard. Make sure to contact us.